Fruit forest installation a success! But to make a wonderful home for this fruit forest, plus gather and store as much water as possible in the soil, we also created a water catchment and storage system. To the best of my calculations, we moved five tons of compost, plus 30# hay bales, buckets of wet coffee grounds and cardboard from countless boxes and dug three 30' swales across the yard. Here are a few photos, and a time-lapse video of the installation day. What a gang! Sorry Jay isn't in the picture, he was in the house preparing lunch. Sheet mulching, otherwise known as lasagna gardening, is an organic practice of putting down layers of alternating carbon-rich in nitrogen-rich materials to accomplish a number of goals. The first is to kill the grass. I know, lots of people worked their entire lives to get the perfect lawn, but the last thing I want to do with my life is mow it -- I'd rather kill the grass and plant something productive in that open space. The second thing sheet mulching does is brings in a lot of organic matter to enrich the soil. Organic matter can be anything, leaves, manure, hay or straw, wood chips, compost, even on garden debris from last year. The trick to a successful sheet mulch is getting the carbon and nitrogen ratios right so you don't have an imbalance. Too much carbon and there isn't any organic activity; too much nitrogen and it gets smelly. 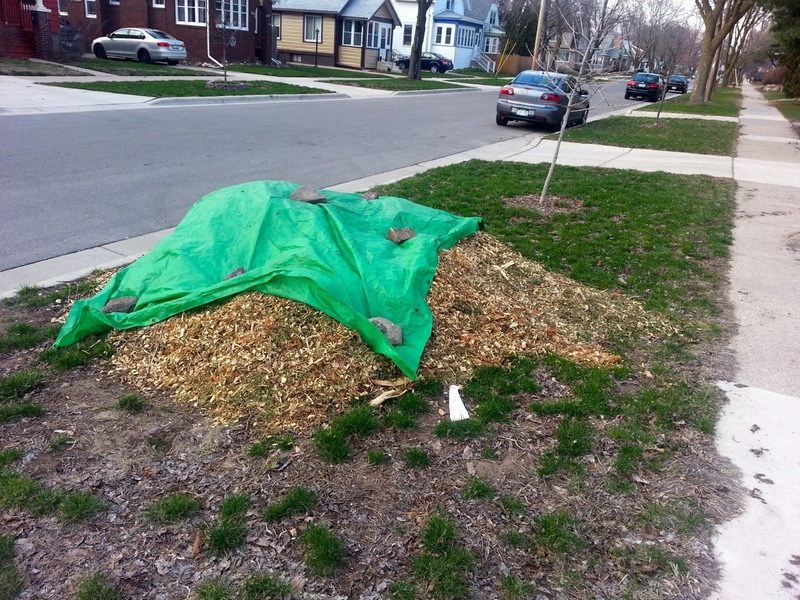 Many people who sheet mulch their yards spend a lot of time collecting compost, old hay, leaves, cardboard, wood chips etc. But since we didn't have much time before we wanted to plant our orchard, we're purchasing most of the woodchips, compost and hay; and we scrounged cardboard from the neighborhood and collected coffee grounds from local cafés. I will take lots of pictures during the sheet mulch process and show you how it turned out in a future post. 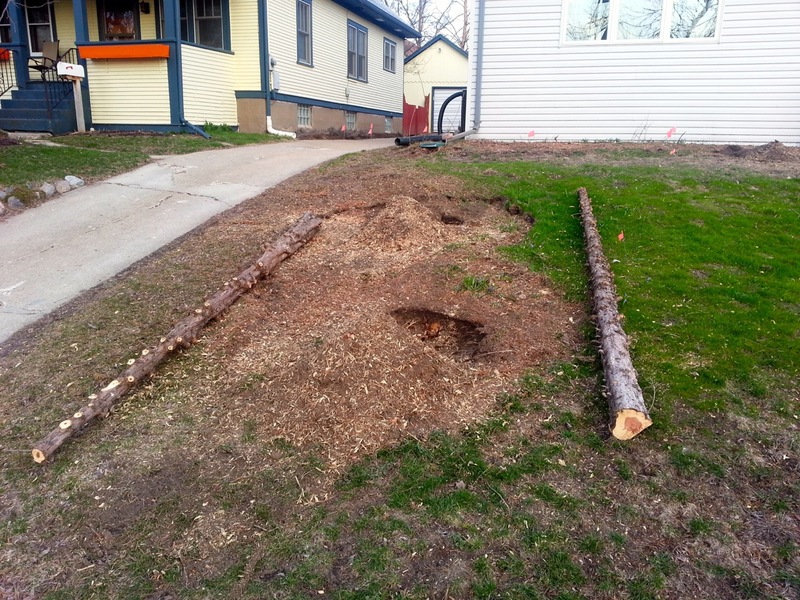 Two juniper trees were removed this week. Props to Garret of Gere Tree Care for the short-notice job. Garret left a load of wood chips (some from the branches of our tree, some from earlier jobs). The tarp is less to keep them dry and more to say "Not free for the taking." In order to properly balance the sheet mulch in our orchard, I wanted to find a free source of nitrogen. A little research and I discovered that coffee grounds contain nitrogen, calcium, magnesium, phosphorus, potassium and trace amounts of minerals. One caution is coffee grounds are acidic and can increase the acidity of the soil. I'm not terribly concerned about this here in Madison, because our soil is quite alkaline, the opposite of acidic. So a few weeks ago I gathered up all the 5 gallon buckets I could find, and started dropping buckets off in the morning and picking them up in the afternoon. The first café I visited, EVP Coffee on Madison's E. Washington Blvd. After a few days in the staff recognized me and just waved me towards the closet where I helped myself to my old bucket and replace it with a new one. At first I thought I was probably being a pain to the barristas, and then I realized I had to get in line! EVP on East Washington Blvd., Madison, Wis. where the staff were happy, even eager, to give me their coffee grounds. The closet where the barristas store grounds for gardeners. The same was true for Moka also on E. Washington Blvd. There, mine was one of two buckets receiving coffee grounds. I tried thinking of other high-volume cafés and realized that there are three coffee shops in my workplace (I work in a complex with three buildings and nearly 3,000 people!) Two of them are not far from my desk, so I've been bringing buckets to them as well. 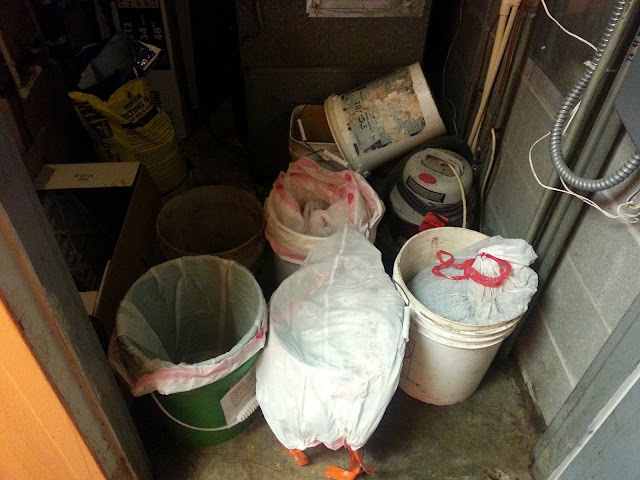 No one even blinked an eye when I approached them to collect grounds, nor appeared to be bothered on my many rounds to swap out buckets. It wasn't until tonight however, that I realized how good the situation actually was. 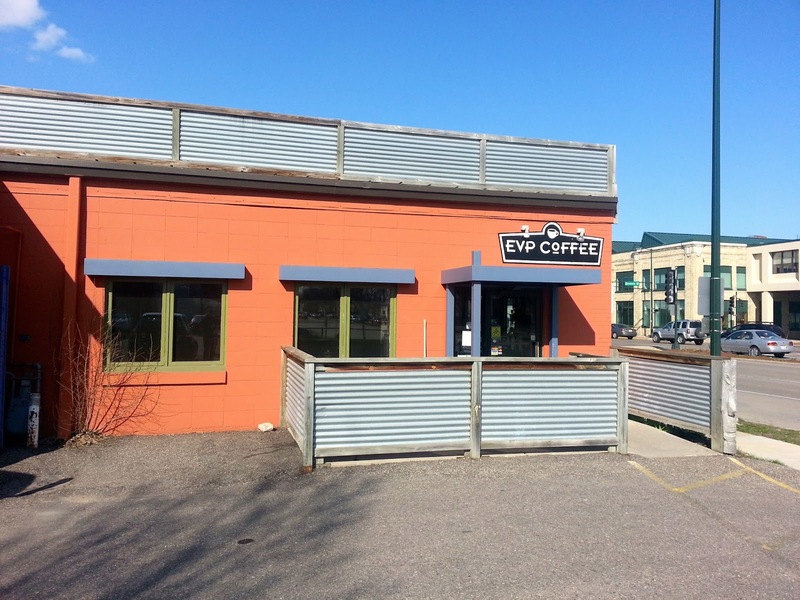 I stopped in at EVP Coffee in the late afternoon, and it was pretty quiet so I got to chatting with the barrista. After swapping out my bucket, he told me that I was doing him a great service. Several years ago, before Madison implemented mechanized garbage pickup, the coffee shop's garbage bins got so heavy, garbage men refused to move them. Even though we now have mechanized garbage pickup, the employees are still happy not to throw the grounds away. So this really is win win win. The coffee shop reduces its waste stream and I get a valuable source of nitrogen. And as of a few years ago, garbage men didn't get hurt moving heavy bins full of wet coffee grounds. 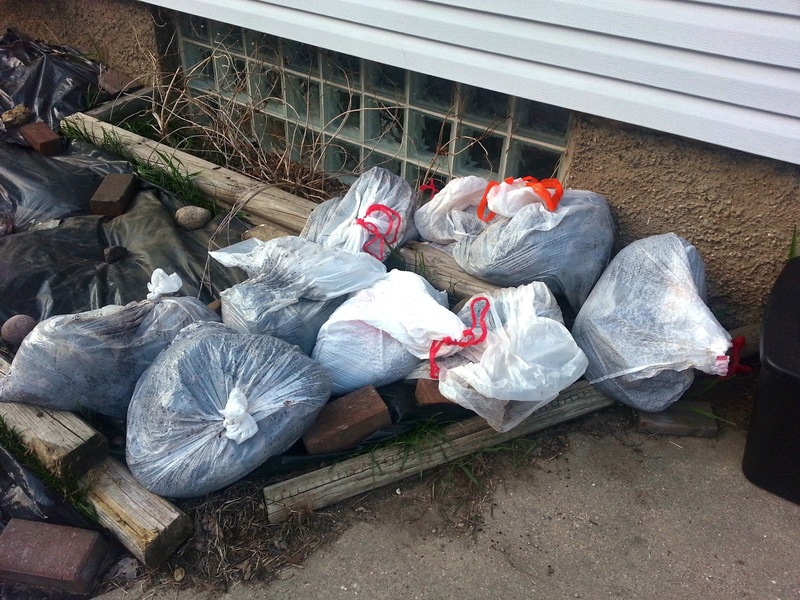 Garbage bags of coffee grounds sitting in my driveway, waiting for sheet mulching day, April 27, 8 a.m. - noon. Jay and I moved into our new home on Feb. 16, and a week and a half later I had surgery, after-which I was largely home bound for four and a half weeks. 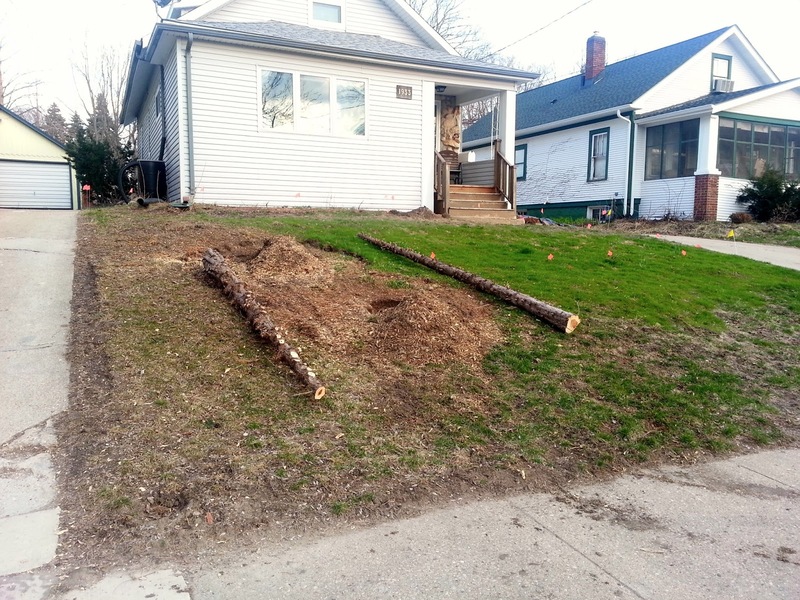 Needless to say, I had a lot of time to think about what to do with our new front yard. 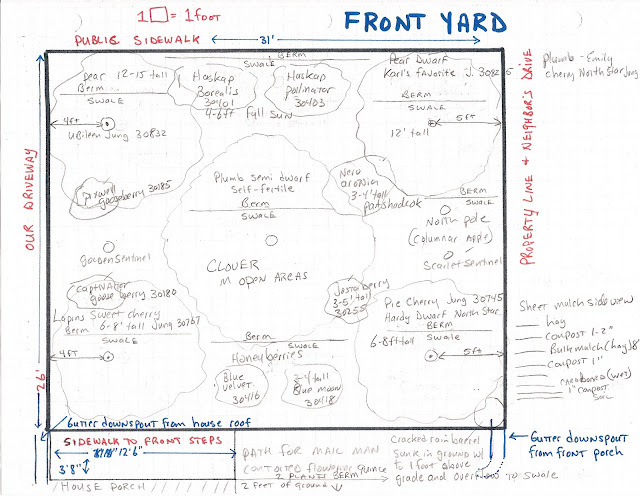 When put together with my desire to cultivate community on our block and the little I had already learned in the first class of the permaculture course, building an orchard in the front yard seemed like a perfectly outrageous thing for us to do. So naturally I began planning. Building community around me, in the place where I live, has always been a deeply held value of mine. I attribute this to the wonderful community of people that my parents built around my brothers and I as we grew up on a small family farm in rural western Wisconsin. The idea of community where I live was also fostered by memories of the wonderful community I built around me when I first lived on Madison's East side in my house on Upham Street. I'm calling this front-yard idea "An orchard for birds and bees, you's and me's." The idea is that as the fruit trees mature, we want people to come to our yard, pick some fruit, visit with us and other neighbors and get to know one another. It's part of watching out for one another, growing food to share, and sharing ideas to grow. And our orchard will get along perfectly with the "Little Free Library" that our neighbor across the street will be installing later this spring. I have a fantasy of putting a sign near her library that says "Grab a book, cross the street, pick an apple and sit for a spell." Admittedly the apple trees won't be producing for several years, but maybe next year someone can pick a gooseberry, jostaberry, honeyberry or contorted quince. Those who visited my house on Upham Street, Jay's house on Rae Lane, or helped me move from Upham or Rae Lane know that I have been carrying around a 400 pound cement bench for the last six years. You'll be happy to know that it's final resting place will be somewhere in this orchard. The Orchard will be installed on Saturday, April 27 in the morning. Partly because I am still restricted to what I'm able to do following hip surgery, and partly because planting even a small orchard with just five trees and a dozen small shrubs is a large task, we are enlisting all kinds of help for what's commonly known as a "garden wheel." Think of it as a barn raising or a quilting bee for green thumbs. The reason this is a larger task than simply digging five holes, is because we're going to be doing much more than planting trees. We're going to smother the grass by burying it in coffee grounds and cardboard and compost and hay, build earthen berms to divert water and dig swales to capture it before it runs into the street and storm sewers. 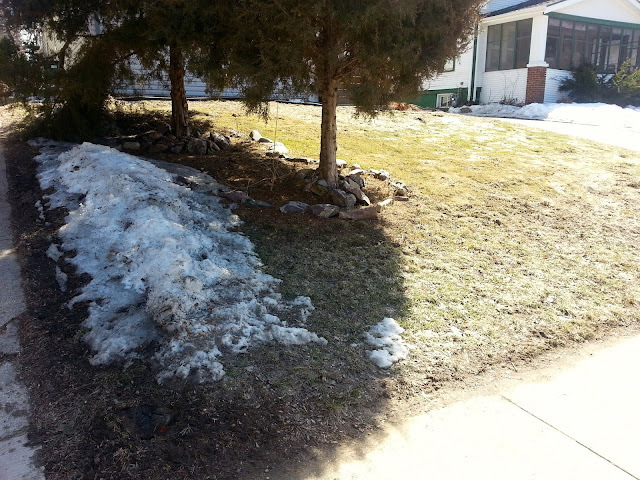 And only after all that is done, we'll tackle the easy job of planting the trees and fruiting shrubs. If you're at all interested in learning about permaculture and this orchard installation, or if you'd like to dig in and help, you are invited to join us. And if you happen to be a member of Dane County TimeBank, you can earn hours for participating in this garden wheel. April 27, 8 AM to noon, and then a vegetarian chili and sloppy Joe lunch! 1933 E. Mifflin St., Madison, WI. New year, new hip, new home, new education! Happy New Year. Much has happened since I last discovered chipmunks had stolen my late beet crop; in a few paragraphs I'll explain what's been going on, and tell you about why I'm so excited about the summer to come. Almost as soon as last year's growing season ended, I turn my attention to my health. Late in the year, I made the decision to move forward with a total hip replacement. It's something that I've always known would occur, and had been putting off for years. But last summer when I found I could not ride my bike for even a short distance without a great deal of pain, I realized the time had come. In short, on February 27 I got a total hip replacement and just a few days ago I was given the green light for much more activity. Like tying my own shoes! And swimming. And bending over so I can work and plant in our garden! Another major change also occurred in February, just a few weeks before surgery. Jay and I have been looking for a permanent place to call home for several years, and we found just the place in January. We moved into our new home on Madison's east side on February 16, with snow on the ground and little knowledge of what might lie underneath. Now that the snow is gone, we have found that our front and back yards are empty canvases on which to paint our dream yard and garden. Finally, sometime late last year I discovered a new term, "permaculture," and a nearly year-long course about sustainable food production, community building, water catchment, and good garden design. Without knowing much about the course, I signed up. It just felt like the right thing to do. With just two classes out of 10 under my belt, I love it! I'll certainly write more about what I learn this year. I hope you will join me for the growing season as The Urbane Farmer gets his hands dirty. 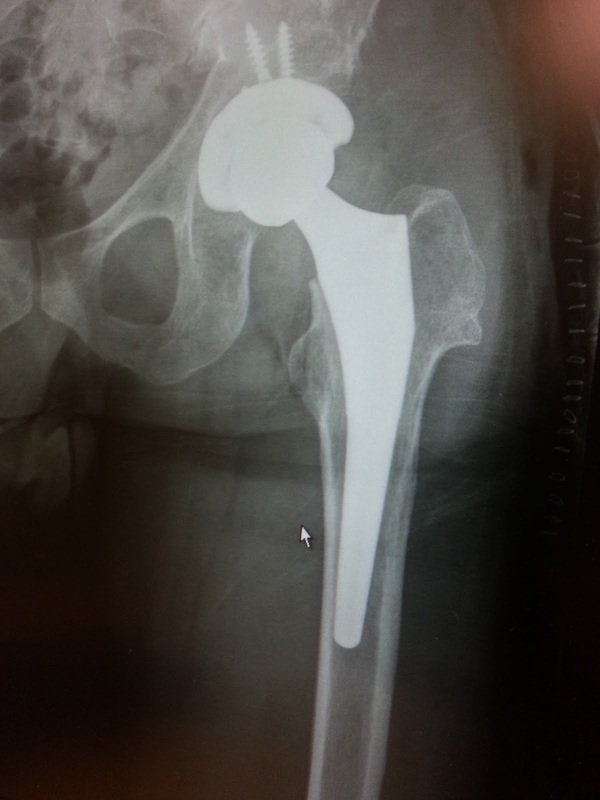 Meet my new hip, a titanium, stainless steel and plastic arrangement installed on Feb. 27.